In 2006, faced with the decision to either switch to Chardonnay or develop a remedy to remove red wine stains from her teeth, Kimberly Walker, Founder of Borracha, crafted an all natural recipe to remove red wine stains from teeth while protecting the enamel from acids in wine. She enlisted the help of a world-renowned laboratory to turn the recipe into a first-of-its-kind formula, and in 2008, Wine Wipes were born. Following the success of Wine Wipes, Pearly Wipes were crafted to remedy every day stains caused from coffee, tea, smoking, and other stains while freshening breath. Whether you call it tannin’ teeth, malbec mouth, or the red badge of courage, the stain red wine leaves on your teeth and mouth is eminently unattractive. With just one swipe, you can wipe that wine off your smile. 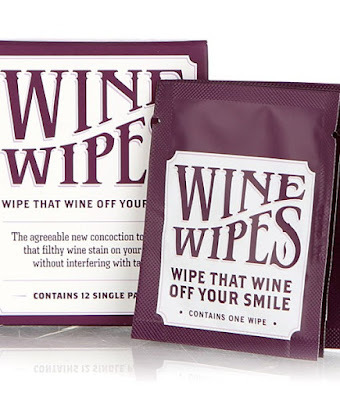 Wine Wipes’ orange blossom flavor ensures each wipe won’t ruin your next sip, so go ahead, Wipe that Wine off your smile. Alleviate everyday damages from coffee and tea stains, bad breath, and other mouth maladies. Pearly Wipes have been created to protect your teeth and freshen your mouth with its peppermint flavor. Use Pearly Wipes after any offending beverage as well as a minty treat after a meal when no toothbrush is in sight. Check it all out at Borracha on Facebook, as well as Borracha on Twitter.